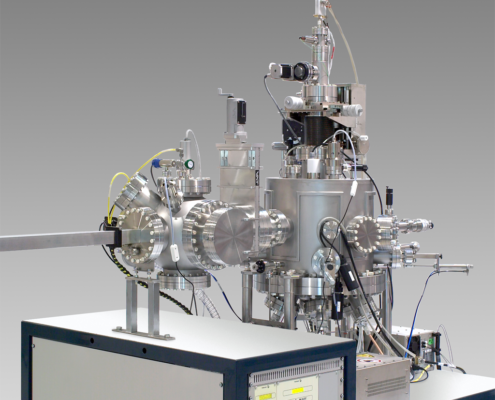 The S450 UHV sputtering system is for co-deposition of up to six materials. The UHV magnetrons can be configured for magnetic materials and are powered with DC or RF power allowing a wide range of materials to be deposited. The sputter geometry is either sputter up or sputter down. The substrate manipulator has various options depending on the application. The substrate heating is up to 1000 oC and can be optionally RF or DC biased. An oxygen resistant heater is available for deposition of oxide materials. The maximum substrate size is 4″ in diameter. The S450 system includes a computer controlled gas manifold for up to four process gases. The sputtering gas regulation allows upstream or downstream gas flow control.